Pick you up from Tianjin Xingang Port exit by our English-speaking guide and driver at 9am. Then set out to Beijing city and visit Tiananmen Square and Forbidden City. Being the most splendid square in the world, Tiananmen Square is a must- see in Beijing. Forbidden City was divided into two parts. One was the outer part where the emperors handling state affairs and ruled the Chinese Empire. The other is the inner court where the royal families are lived in. When you are strolling in the Forbidden City, you can’t help imagining the life of the imperial family. After the tour, we will transfer you back to hotel. Our English-speaking guide and driver will pick you up from the hotel and then drive to the Mutianyu Great Wall. Mutianyu Section was first built in the mid-6th century and older than the Badaling section. The Mutianyu Great Wall has the largest construction scale and best quality among all sections of Great Wall. In the afternoon, continue our journey of exploring the Chinese culture to Temple of Heaven. Temple of Heaven was an imperial sacrificial altar where the emperors pray for good fortune and abundant harvests. After ending the tour, you will be transferred back to the hotel. 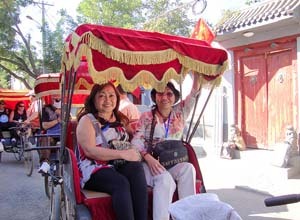 Our English-speaking tour guide and driver will pick you up from your hotel and take you toward the Summer Palace and then Hutong Tour with rickshaw. Summer Palace is the largest ancient preserved garden in China and has three unique areas which were Court Area, Longevity Hill Area and Kunming Lake Area. After a short lunch break, we will heading for the Hongtong, Hutong are maybe some of the most emblematic spots symbolizing Beijing city in the eyes of tourists coming to China worldwide. Before 4pm, you will back to Tianjin Port. We just sent you an about the tour details, please check. Thank you! We are interested in this tour but we are only 2 people and were wondering if we could be added to a group to get a better price than a private tour for 2. I know you offer group tours but I am interested in visiting the Wall at Mutianyu. This is a private tour, we can not add you into other groups. If you can find more people join in you, the price will be cheap. I am undecided as to whether to do the 3 day tour (A) or 3 day tour including terracotta warriors. It seems the latter means missing one of the sites in Beijing (summer palace) and I’m worried the 3rd day will be rushed leaving not much time to see the forbidden city, Tiananmen Square and the Temple of Heaven in any detail. We have sent you an email about tour details, please check. Yes, received it thanks. Will get back to you in due course.